CPS promotes international service projects for Tulane students and faculty. Public service programs located outside of the United States provide a unique opportunity for students to explore different cultures and communities while doing public service. The incorporation of public service into study abroad programs creates a bridge to different cultures. This bridge facilitates the development of meaningful relationships and allows students to expand their skill sets while contributing to the communities that have welcomed them to their country. The Tulane Himalayan Experience Program is an international intensive service-learning program and 3-credit class (Philosophies of Nonviolence and Ecology), offered in partnership with the Tulane Philosophy Department. 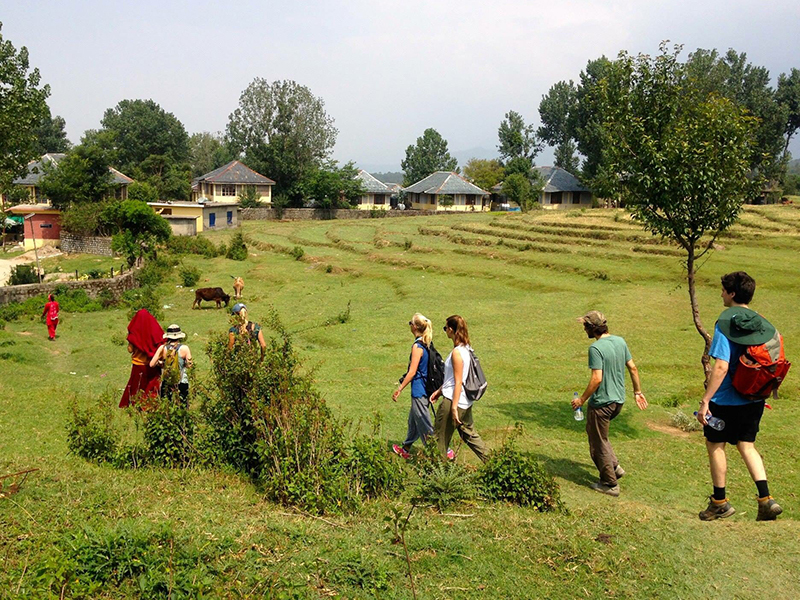 Students will spend five weeks in India involved in community service projects while engaging in a variety of learning opportunities to develop an understanding of North Indian and Tibetan culture and philosophy. Prerequisites: This course has no prerequisities. Academic Credits: Students will earn 3 academic credits (PHIL 3930: Philosophies of Nonviolence and Ecology) and fulfill the second tier of the public service graduation requirement. Application Deadline: February 22. Apply now. The Ecuador program is an intensive, immersive study abroad course with a strong focus on experiential learning, design thinking, and engaged scholarship. The course will be primarily based in Ecuador, with expectations for additional work before and after the international experience. Students will expand their understanding and technical abilities via lectures and readings; development, implementation, and presentation of independent research projects; journal entries and reflective essays; and close interaction with residents and practitioners. Academic Credits: Students will receive 3 total credit hours (EBIO 3780: Tropical Field Biology and Conservation) and fulfill the second tier of the public service graduation requirement. The course serves as a 3000-level elective in the Department of Ecology and Evolutionary Biology, and as an elective for the Social Innovation and Social Entrepreneurship (SISE) minor. Application Deadline: January 31. Apply here. The "Engage in St. Martin" program will develop students’ understanding of basic ethnographic methodology and anthropological theory through lectures, written assignments, and fieldwork exercises. It will introduce programs that promote cultural, food, and economic sustainability. Through these activities, students will develop close mentorships with Rastafari members of the 4 Real We Agree With Culture association and learn from local community leaders, officials, artists, activists, scholars, and writers. Students will be exposed to the history and contemporary social issues of the Caribbean, grassroots and social movements, including the Rastafari movement; and gain a firsthand sense of the socio-political and economic canvas shaping the island's realities. Prerequisites: The following courses are recommended but not required: Introduction to Cultural Anthropology (ANTH 1020), basic French and/or Haitian Kreyol. Academic Credits: Students earn 3 credit hours (ANTH 3550: Social Change, Sustainability, and Postcolonial Identity in the Caribbean) and fulfill the second tier of the public service graduation requirement. Application Deadline: February 25, 2019. Apply here. Applications for all CPS International programs are submitted through the Office of Study Abroad's application portal. Once on the site, search for the program you wish to apply for, by either using the search function or by clicking on the country of interest on the world map. Merit and need based scholarships are available for students participating in CPS sponsored international programs (India, St. Martin, and Ecuador). Scholarship requests are incorporated into the program application.